Joshua Vickery is a vocalist, actor, teacher, producer, musical director, arts administrator and conductor. Joshua’s love of music and the arts has allowed him to have an incredible career thus far. He earned his Associate of Arts Degree in Vocal Performance at Indian River Community College, receiving the honor of Outstanding Fine Arts Graduate. He then earned a Bachelor of Arts Degree in General Education/Music at Palm Beach Atlantic University where he served in various leadership roles. Joshua grew up with a passion for music ministry. While studying music in college, he served as Associate Minister of Music and Worship at First Baptist Church of West Palm Beach for two years where he directed the church’s vocal praise teams, led music services and assisting in directing the West Palm Beach Singing Christmas Tree production, which was viewed by thousands of patrons in Palm Beach televised. 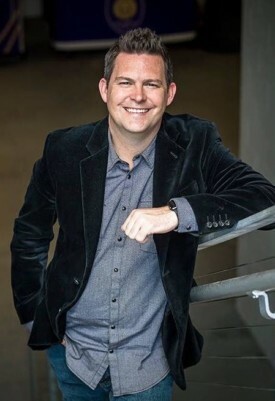 In 2003 he became the Worship Arts Director of Orlando Baptist Church and Fine Arts Director at Orlando Christian Prep, a K-12 school where he taught voice, and vocal performance and developed and directed several school choirs. His journey then continued on to Aloma Church where Joshua combined his talents to lead a large church music program with every aspect including choirs, orchestra, and youth programs. During his tenure in these churches, he founded and served as the Executive Producer of the Central Florida Christmas Celebration in which he coached youth and adult vocal performers, developed shows and scripts, and managed hundreds of volunteers. Joshua has been a featured soloist in countless venues, produced musical recordings, and been the director of numerous productions. Joshua has been an entertainment leader, casting director, and vocal coach for Walt Disney Entertainment. He also serves as a consultant for other arts organizations in its beginning stages and a voice for local, state and national arts advocacy. Joshua has lived in Orlando since 2003 and has enjoyed serving on the board of several fine entities, and a member of FAACS School Administrators, Visit Orlando, Young Professional Network, Central Florida Leadership Forum, Zebra Coalition, Arts for Health Florida, UCF Non-profit Advisory Board, Emerging Arts Leader Mentorship Program and Leadership Orlando. He has the honor of several accolades including being named Arts Educational Professional of the Year by the Florida Arts Education Alliance, Top 3 Arts Advocate by Orlando Weekly, and 50 Most Powerful People in Orlando and Top 3 Community Leader by Orlando Magazine.